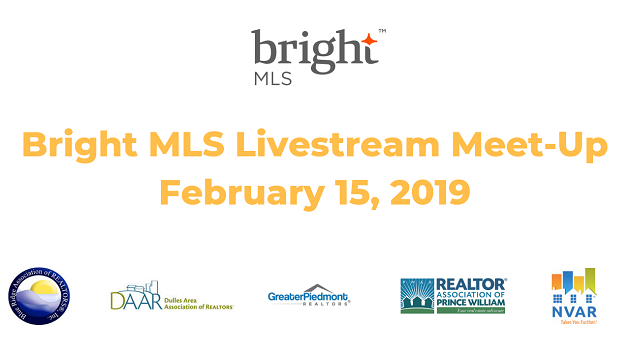 Join leadership from Bright MLS and our neighboring REALTOR associations for an opportunity to ask questions in a dedicated livestream member forum on Friday, February 15th, 1-3PM. Ryan Conrad and Christine Richardson of NVAR will join the discussion and facilitate dialogue and questions from Bright MLS subscribers via livestream. DAAR members who are Bright MLS subscribers are encouraged to use this opportunity to have a constructive, respectful dialogue and discussion and to submit your questions about next steps for the Bright transition. Questions can be submitted during the livestream or in advance to Phyllis Stakem, President, DAAR via president@dullesarea.com or Christine Windle, CEO, DAAR, cwindle@dullesarea.com. Advanced registration is required and is open to members of NVAR, DAAR, PWAR, GPR and BRAR who are Bright MLS subscribers. For more information on reporting an issue to Bright MLS, news updates and training opportunities, visit DAAR Bright MLS Resources and Support.